Editor's note: Nancy Hansen is an Alpine Club of Canada Ambassador who has recently returned to Nepal to attempt a summit of Cholatse with her partner Ralf Dujmovits. Follow their story on our blog. Five of us (three Canmorons, one New Yorker, and a German) are trekking and climbing in Nepal. The last time my partner Ralf and I were here was two weeks after the devastating earthquake in 2015. We left with heavy hearts, after having seen the tragic loss of life, injuries, and endless destruction of homes, schools and businesses. The one and only Ama Dablam. Upon arriving in Kathmandu two weeks ago, I had to keep sunglasses on to hide my tears of joy. They still have a long way to go, but the resilient Nepalis have worked hard to get back to some kind of normal. The streets are complete madness, shops are busy, the tourists have returned, and rebuilding is underway. A Chorten and Mani stones on the way to Khumjung, above Namche Bazar. We are trekking in the Solukhumbu (Everest) region. Don and Michelle (Canmore) will complete the three pass route. Each pass is just over 5,300 metres, and the views are mind-blowing. Chip (New York) is here to write a story about Ralf for Men's Journal. He will wait while Ralf and I climb Cholatse (6,440m). Stay tuned! Michelle trying her hand at ploughing the potato field at 3,800m. She was trying to whistle like Pemba, the Sherpa farmer beside her. We all had a lot of laughs! Some monks from the Thame monastery invited us to observe their Pujah. One of the original sets of their books is kept at the monastery - the books are about 500 years old, and they still read from them during their Pujahs! Nancy making friends in Khunjung (4,200m). Here is Ralf, hiking above the tiny village of Thame. The mountains behind him are all over 6,000m. Views (from left to right) of Mt. Everest, Lhotse, Nupste, Makalu (far behind), Cholatse, Taboche, and Pharilapche, from Renjo La (5,360m). Nancy in front of Gyachung Khang, a 7,950 m peak between Everest and Cho Oyu. Photo by Ralf Dujmovits.Nancy in front of Gyachung Khang, a 7,950 m peak between Everest and Cho Oyu. Photo by Ralf Dujmovits. Cholatse (6,440m) is the mountain on the left. 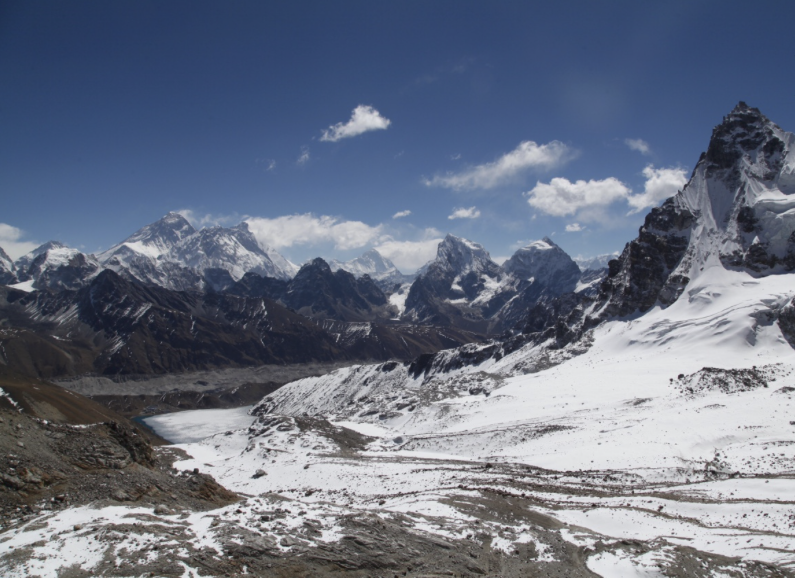 Ralf and I will ascend the glacier between Cholatse and Taboche, and then climb the right-hand skyline to the summit. Looks like fun!